As you probably guessed (the photograph probably helped), she plays the harmonica on the CD. She is also responsible for the song: Four and Nine...well we tried to get Colin to sing it, but he sounded to girly. The lad on the funky accordion is, Hurling player, Colin McGill from Laois. Tadaammm. Colin is still recovering from his encounter with Brian Kennedy and the Corrs. 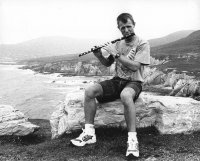 Well...flute and whistle and sax really...are all played by Pat Fitzpatrick (Wexford). Pat made his studio available to us for the recording and is a very talented and versatile musician who seems to be able to play anything that has reeds and whistles. Pat also has his own album (featuring flute, whistle, sax and pipes) Carraig Ghuaire. Check out his page to listen to some of the tracks. He is also involved in a group in south Dublin called Cruinniu. 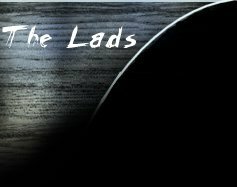 Check out their home page to find out about gigs. Bouzouki and guitar and bodhran are played by Olivier Longuet (Britanny). oui oui. The bouzouki used on most tracks was made by Paul Doyle. Hans Speek has a page with pictures of Paul Doyle bouzoukis. oui oui. As a matter of interest, for all guitar and bouzouki nerds, the tuning used is DADGAD for the guitar and GDAE for the bouzouki. Again Hans as a few chord charts on his page for the GDAE tuning. oui oui. So many details about the bouzouki... who do you think made the web site ? oui oui.